Enter your desired route in the Route Editor. The Pack icon, or suitcase, is located on the bottom right of the Route Editor. The Pack icon is located in the lower right of the Route Editor box. Pack analyzes your planned route against the data you already have downloaded, and then prompts you to download any additional charts, plates, TFRs, METARs, TAFs, AIR/SIGMETs, NOTAMs and fuel price data you may need for offline access. 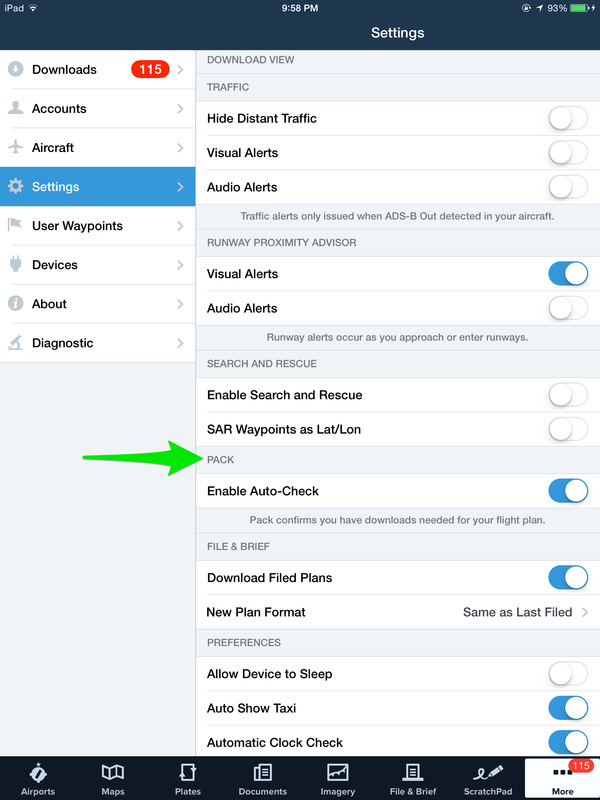 Pack has a Settings control that toggles Enable Auto-Check on and off. Turning Enable Auto-Check ON enables Pack to automatically start the route analysis process. In the OFF position, you can still trigger Pack manually by tapping on the icon in the Route Editor. Toggle the auto-enable for Pack in the Settings menu. The red exclamation point badge on the Route Editor icon and on the suitcase icon indicates that you need to pack for your trip. The red exclamation point badges indicate that you need to pack for your trip. Tap on the Pack icon to view the download detail for your trip. View the data you need to download for offline use in the Pack view. Download items individually by tapping the blue download arrows, or trigger the entire set by tapping Pack in the lower right. Each type of chart or set of data is bundled into a single line item. You can download each line item individually by tapping on the blue arrow(s); or you can trigger the entire set by tapping the Pack button in the lower right corner. To help you manage the available space on your iPad, each line item is labeled with file sizes. The total file size is indicated in the lower left corner. Modifying your route via typing in the Route Editor in the Maps view; touch planning in the Maps view; typing in the File & Brief view; or accepting expected route notifications (Flight Alerts) triggers a new Pack analysis. The updated route is evaluated and you’ll be presented with any additional data you need to download. Pack can be accessed on the iPhone in the Route view. Tap on the Menu button, then scroll to the Routes section. Tap on one of the three recent routes listed, Favorites, Recents, or Create to select the route for which you wish to Pack. After choosing or entering a route, scroll to the bottom of the Route page to the Pack line. Just like on the iPad, after a few seconds Pack analyzes the route to determine if additional data needs to be downloaded. On the iPhone, access Pack by first choosing a route in the Menu. On the iPhone, tap on a route to view the Pack status. Pack view shown on the iPhone. 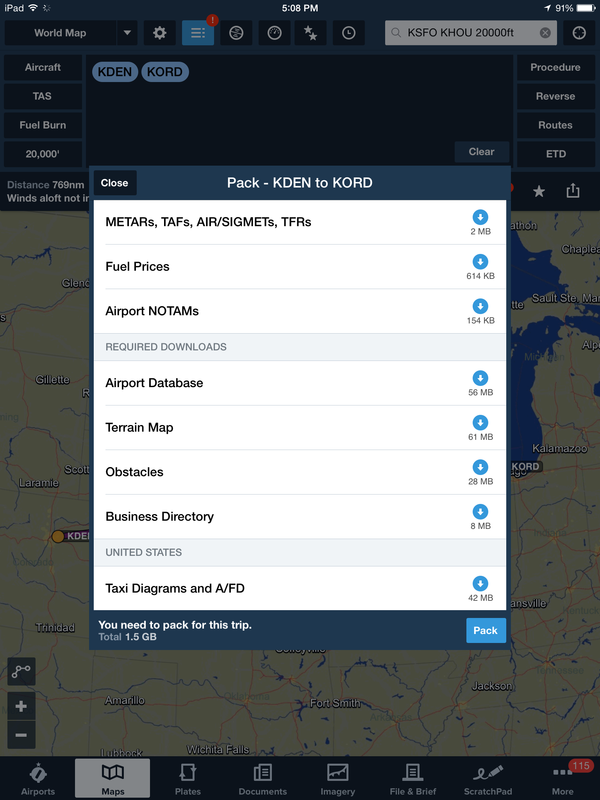 Pack is available with version 6.1 of ForeFlight Mobile Standard, Pro, and Canada. ForeFlight Mobile version 6.1 is a free download for subscribers via the Apple Store. For additional information, be sure to review the Pack section of our Pilot’s Guide. 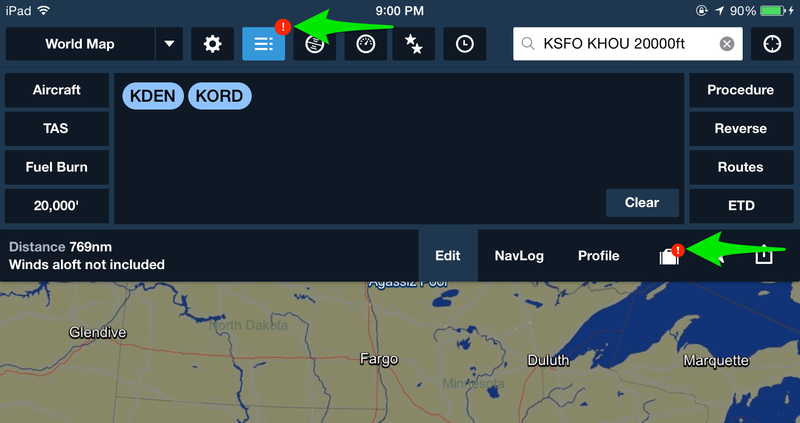 This entry was posted in Canada, ForeFlight Mobile, Software Updates and tagged App Store, aviation, electronic flight bag, flight planning, foreflight, ForeFlight Mobile, iPad, iphone by ForeFlight. Bookmark the permalink.